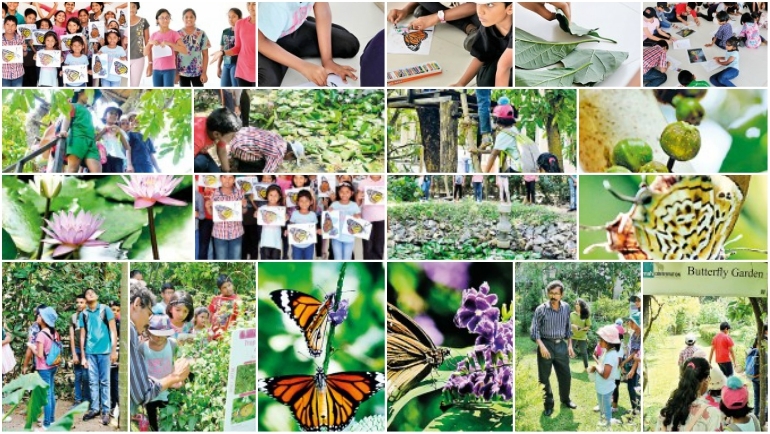 On March 31, 2019 a session named ‘Festival of Trees’ was held by Dilmah Conservation and the Funday Times. This event was basically held to teach us how forests become a necessary part of life on earth. Held at the MJF Centre in Moratuwa, it certainly offered us a great experience. The participants were divided into two groups by the organizers as participants below 10 years and above 10 years. The smaller kids went to see the Butterfly Garden, which we went to visit later. We were taken to a small Arboretum first. An arboretum is a small area where many trees are grown, in order to conserve them, for scientific research and for educational purposes. Here, we were able to see some species of trees found in Sri Lanka, such as the suicide tree (kaduru), vetakeiyya, thimbiri, vallapatta and indi trees. We were told about some uses of each plant and some other interesting facts. It was a very cool area and we were very glad to stay there for a while when it was really hot outside. We even climbed onto a tree-house from where the view was spectacular. Next, we went to the Butterfly Garden. It was a beautiful garden and it was said that 54 species could be found in the garden. Of course, not all species could be seen at once, as butterflies only come out at a certain time of the year; either when it’s hot or cold, depending on the species. Luckily, we were able to spot some, such as the Common Tiger, the Blue Tiger, the Jezebel, the Lemon Emigrant, the White Four-ring, the Leopard (not the cat-like leopard!) and the Psyche. We even saw the eggs of some butterflies, as well as a larva on a twig. It was a very exciting time, trying to search for a butterfly, and getting a close look at it carefully, without frightening it. We went back to have some refreshments, where the youngsters joined us too. We were then taken to the auditorium of the MJF Centre. There, the little ones were given a picture of a butterfly to colour. The elder ones had to sit in groups and make up a story with the topics chosen from a raffle draw. We had two teams and our topics were about biodiversity and the water cycle. We had a great time making up stories and then we narrated our stories to everyone present there. Finally we said goodbye to our new friends, taking back with us a new experience with the environment. We are thankful to everyone who organized this event and made it a success.